In this blog post I will be answering 4 questions that talk about Pursuit With Purpose. I was listening to a podcast and what the speaker was saying really made me think about why I started my business and what I was trying to achieve through my website Jo’s Crafty Hook. 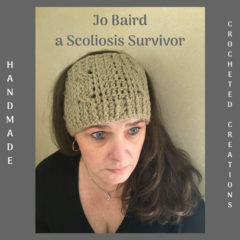 The purpose of my website is to give other Scoliosis Survivors hope as they cope by doing Crochet. In pursuit of my purpose I want to share what Scoliosis is and the effects it has on Survivors. Also in pursuit of my purpose I want to share ways for us to cope through Crochet. The podcast I was listening to was by Melyssa Griffin. It was the very first podcast in her “Pursuit with Purpose” series on iTunes. I met Melyssa when I enrolled in her course called Pinfinite Growth where she teaches how to get more out of Pinterest when growing your business. Melyssa teaches entrepreneurs and bloggers how to grow their audience and skyrocket their income. Melyssa is celebrating the 1 year anniversary of her “Pursuit With Purpose” podcast series. By celebrating the anniversary she asks us to listen to the very first podcast called “My Story and How I’m Infusing My Life and Business With More Purpose.” In the podcast Melyssa has us asking ourselves 4 questions. These questions are to help us focus on our goals. She wants us to really think about what that purpose might be for us and how to bring it into our life and business. You can swing by iTunes and listen to this for yourselves or listen to it right now to see why I am sharing this post or to help you focus on your purpose. You can also find out more about Melyssa at and her podcast series here. Now we come to the purpose of this post, to answer her 4 questions and to give you a little bit more insight into why I share my story with Scoliosis and my love of Crochet. The first question Melyssa asks is: “What fired you up in life, what was super fun for you?” The things that fired me up in life was my family and experiencing the things we did together is what made it super fun for me. When I was growing up it was just me, my sister, and our mom. My parents divorced when I was 3 years old, so I didn’t have a “normal” family upbringing. Because of this I always told myself I would have a “normal” family setting when I had children. That is exactly what I did. I married at 19 and had 2 children by age of 22. The super fun part was keeping my children busy doing things they enjoyed and living their experiences through their eyes. My husband and children were what fired me up and still are! My kids are now 26 and 23 and even though they are grown they are still my main focus in life along with my hubby. The second question was “How would someone in your life describe you now?” They would say I have slowed down and I don’t get out much. That I spend all my time crocheting, which in my eyes is NOT a bad thing. lol They would say I do for my children and husband when needed and asked. They would also say I am in pain all the time and try to take care of things when I can. The people in my life have seen what my disease, Scoliosis has done to my life. They experienced all the pain and suffering right along with me. They have even experienced the achievements I have made during my struggles with Scoliosis. The third questions was “Why do you feel like you were born?” I have asked myself this questions so times throughout my life. About 18 years ago I finally figured out why I was born, it was to share my experiences with Scoliosis. It was to let others know that even though we get knocked down in life, we do get back up. When I ask myself this question now it is the same thing but there is another reason I feel I was born and that was to share my LOVE of Crochet. People still ask me “What does Scoliosis and Crochet have to do with each other?” Now I can tell them exactly what they have to do with each other in my life. Scoliosis and Crochet can offer hope and a way to cope. I want to give Scoliosis or Chronic Pain sufferers hope. I want to tell them how Crocheting for me is such a HUGE part of my life, not in just creating things with my hands but in having a coping mechanism to help me get through some of my worst days. I want to share my trials and triumphs. I want to give them a way they can use Crochet to cope! The last question has me really thinking about where I am at with my purpose. Melyssa has us asking ourselves “In your current life are you not living in alignment with your purpose?” ” Where are you living?” ” What needs to shift?” “How can you bring more of that into your life today?” These questions really got me thinking about what I am trying to accomplish with this blog and sharing my love of Crochet. I have to say these questions really get you thinking. I am just starting out as a blogger. I have barely begun reaching for my purpose. I know that in order to get where I need to be I have to spend more time learning and that I have a long way to go to bring more into my life today. I need to learn more about blogging for one. lol I need to do more research every day on Scoliosis so I can supply my audience with the right information about it. I need to learn how to draw in more people so they can learn about me, my projects, and my life with Scoliosis. Lastly, I need to learn how to keep myself happy so when I share a story people become informed and that they want to come back for more. I have along way to go but in sharing this story with you today is a step in the right direction! I hope you take the time and listen to Melyssa’s podcast because later in the podcast she gives us some pointers on how we can reach our purpose and implement them in our life or business. The information she shares can help you to become who you want to be. We all want to become a better person, we still have goals in our lives no matter where we are at in life. Please take the time and stop by Melyssa’s website or subscribe to her “Pursuit with Purpose” podcast series. Her podcasts have already helped me to focus on my purpose! She can also be reached on Instagram at @melyssa_griffin. Thank you for taking the time to read my post. If you have any comments or questions, I would LOVE to hear from you! You can post your comments below or email me directly at jo@joscraftyhook.com. If you would like to have my posts sent right to your inbox please fill out the form below. I look forward to hearing from you!